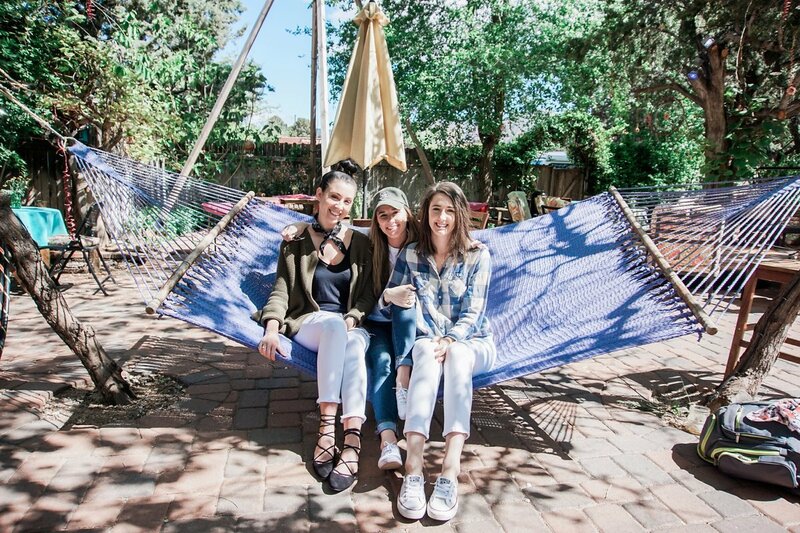 Girls Weekend Trip to Sedona – Full RecaHi! Thanks for sticking around and being so patient with me, this post is long overdue but I have been such a busy bee lately. It’s all about balance, right?! 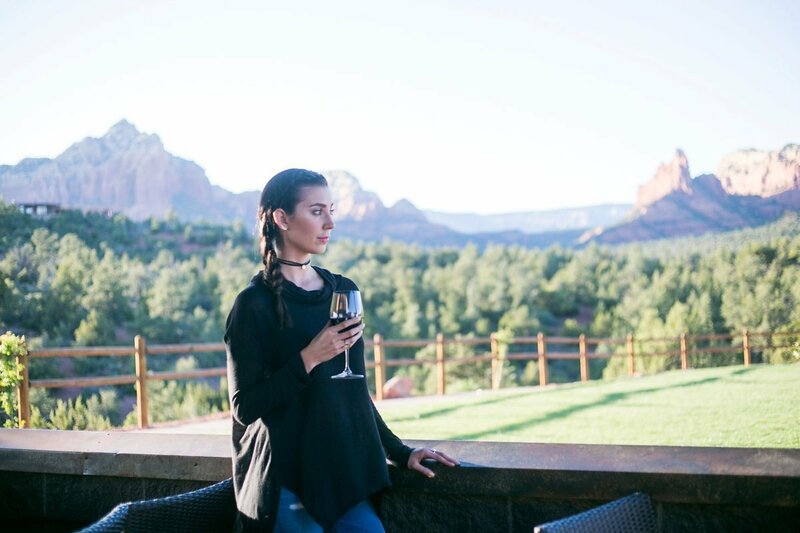 At last, I am SO excited to share with you, my girls weekend trip to Sedona, Arizona! 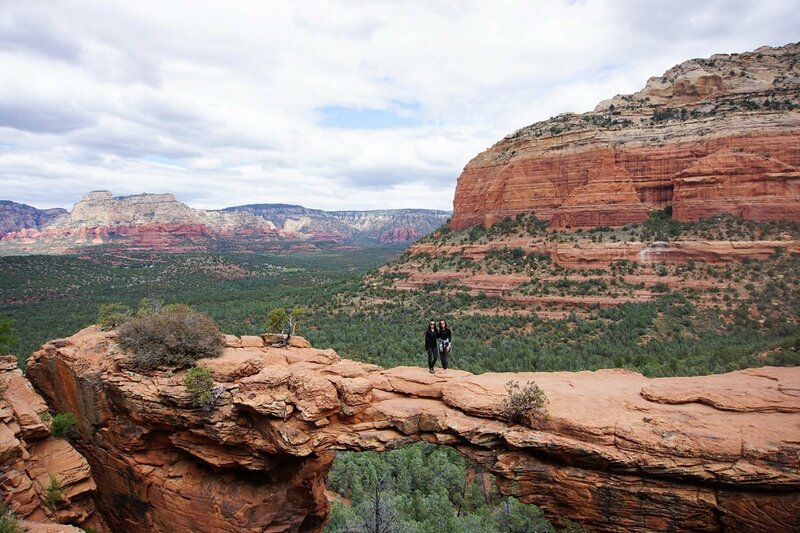 My two lovely girlfriends, Brooke (of Nomadic Newlyweds) and Tasha (Travel Part Time) spent a full month taking “Weekend Retreats” and Sedona was second on their list. I was so excited to be invited, as our last girls trip was to LA where we first really met and bonded. Both of these ladies have a focus on travel blogging (and photography) so this was a really new and exciting adventure for me to get a glimpse of their travel and blogging ways while giving them a taste of mine. 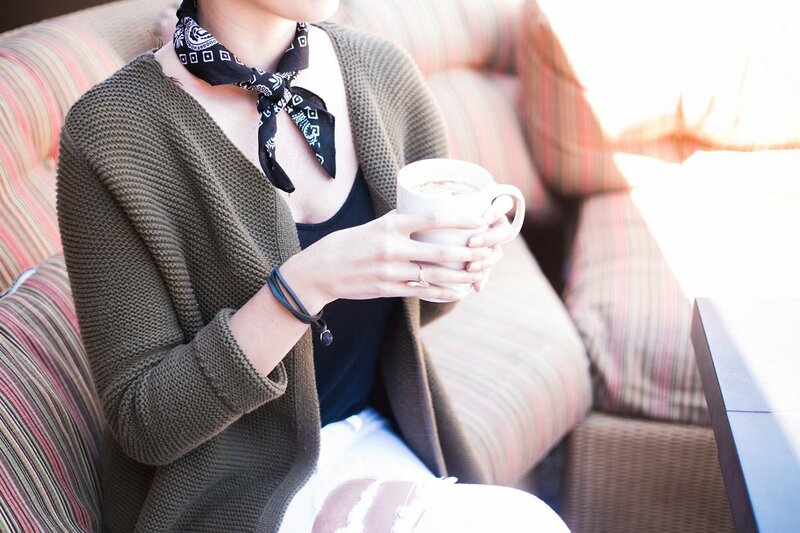 Photography, travel and fashion, what could be better?! 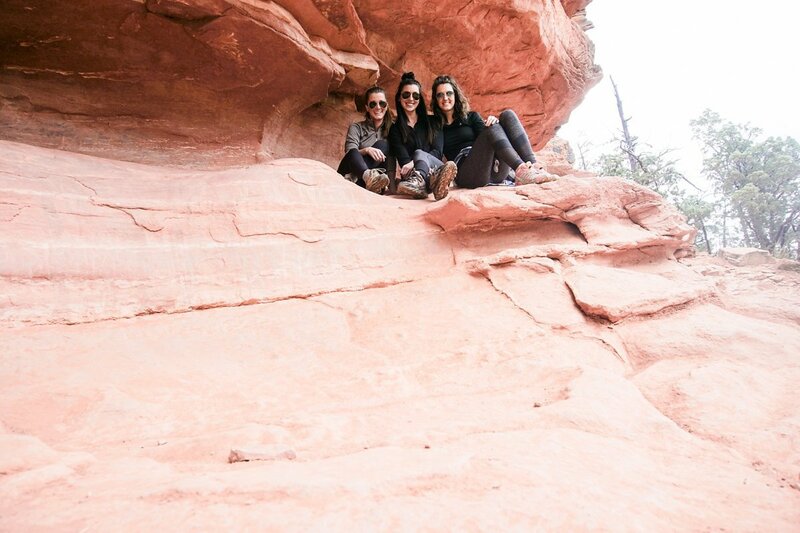 This wasn’t my first time to Sedona, I have actually been a few times, but this was my first trip with girlfriends which was a totally new adventure. I wanted to share with you all some of the local places we stopped at during our trip, where we stayed and all of the yummy food we munched on. Where to begin?! I have traveled to many different places around the United States and have stayed at my fair share of hotels and resorts. There are a few things I pay close attention to before booking. I check out the reviews online, pictures of the resort, amenities, and distance from attractions/restaurants. 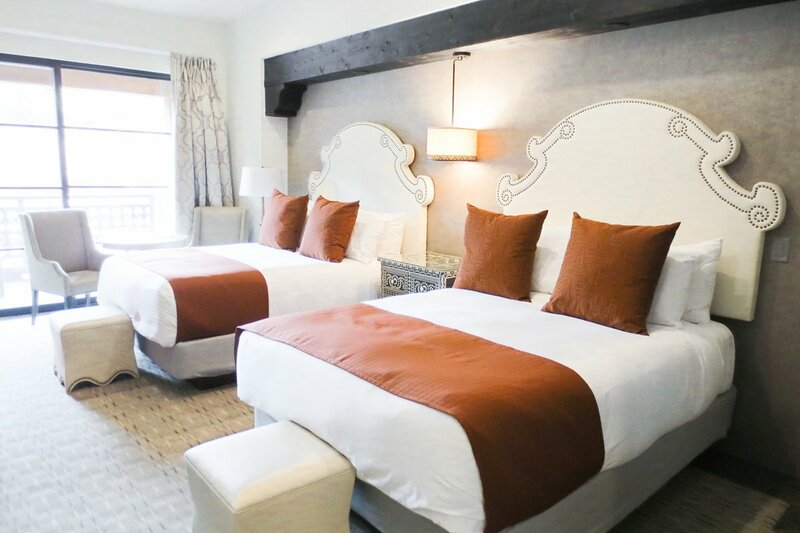 I definitely do look at the accommodations as well, but when vacationing, I do not plan to be in my room all that often. 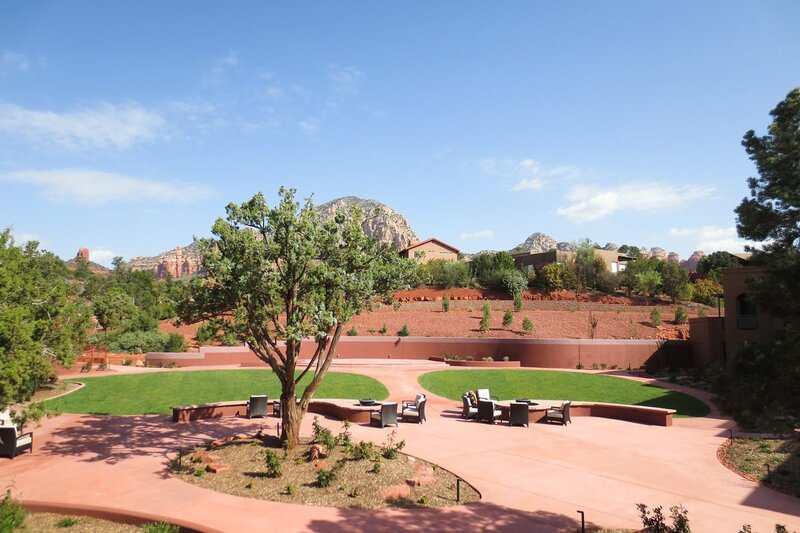 Sedona Rouge Hotel & Spa is rated four stars but in my eyes should be five. I was so pleased with my stay and would definitely stay again! 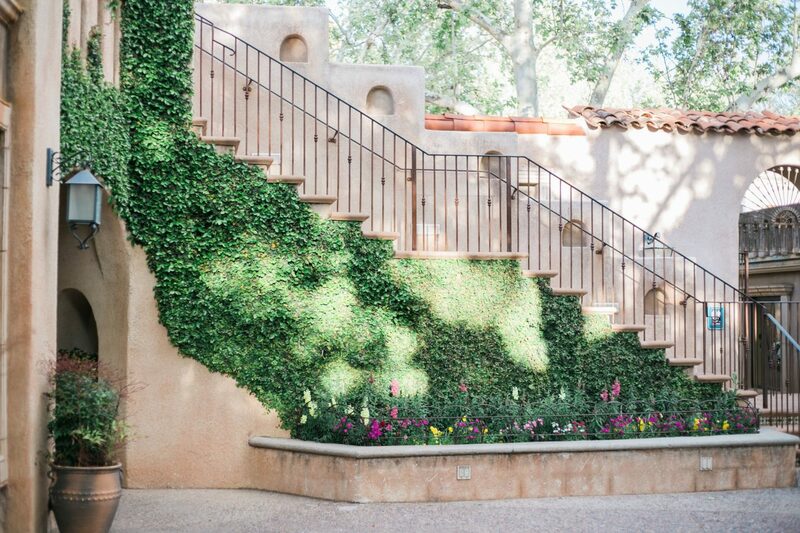 The overall appearance of the property is very gorgeous. 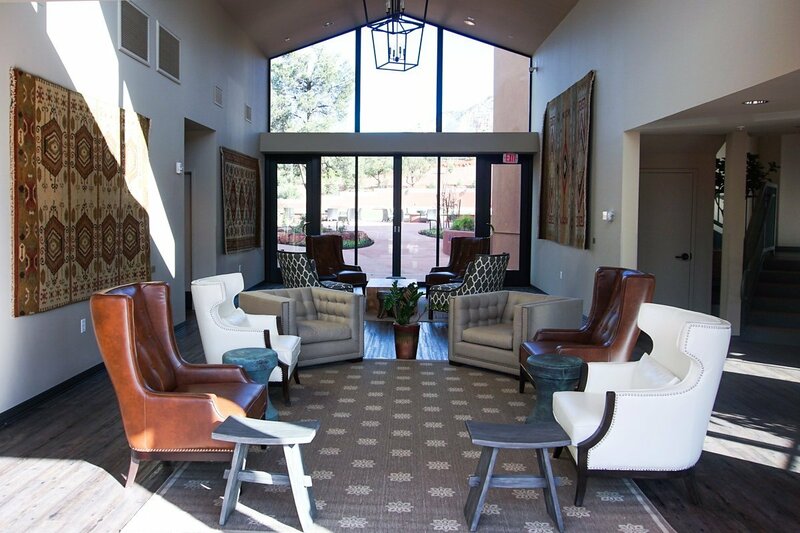 From the beautiful fountains and seating area in the front lobby, to the neutral furniture pieces in a secluded seating area by our room. It was very apparent that they pay close attention to detail and I truly loved that. Our room was STUNNING. 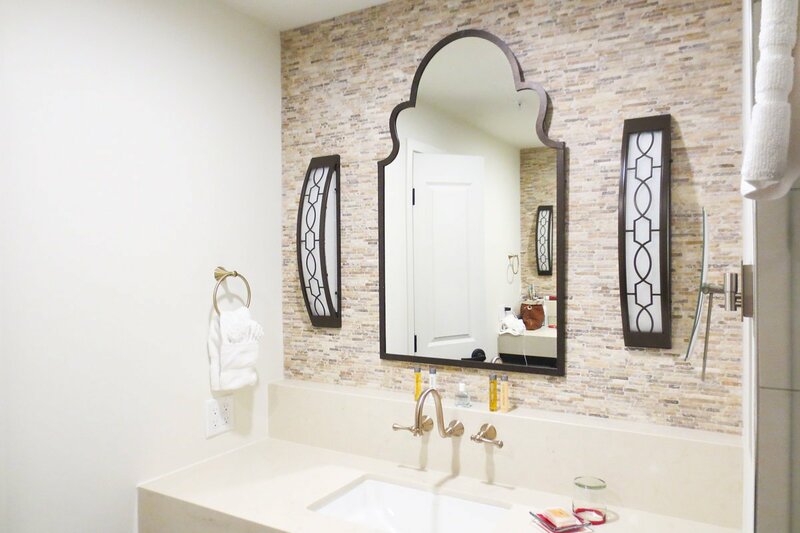 The bed frame, spacious bathroom and private back patio were all beyond perfect. Funny side note: We weren’t aware there was a hidden fringe in the TV cabinets until we brought back mimosa supplies from the store and frantically searched around the room! The room had plenty of storage place, was very clean and cozy. As I mentioned, there was a cute seating/ lobby area close to our room which quickly became our hangout during the little down time we had. 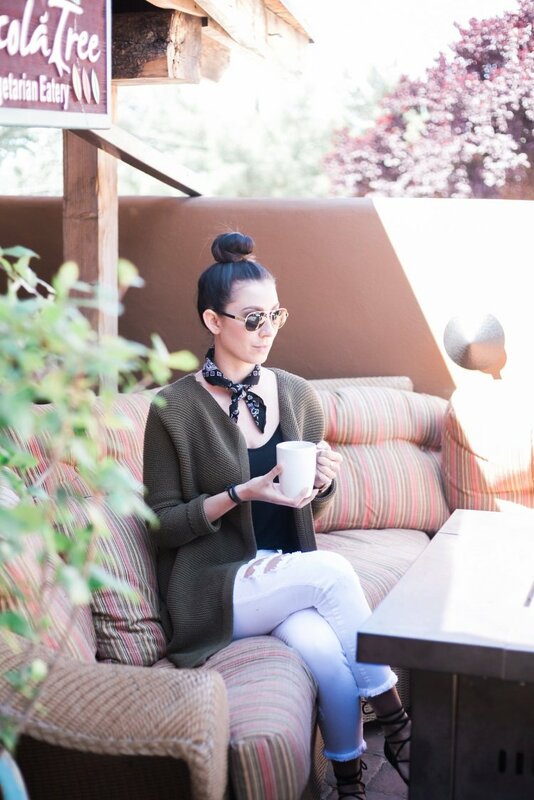 Perfect spot to sip wine and chat, as well as snap pictures. 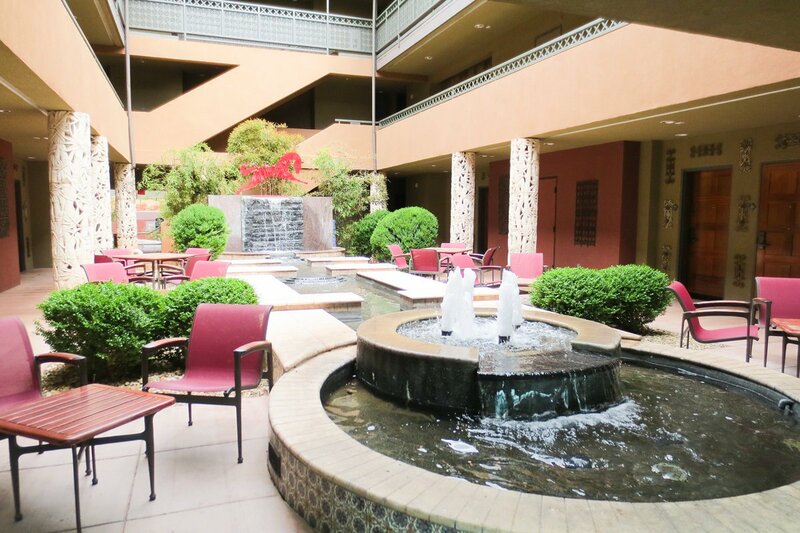 Onto amenities, from the pool, hot tub and restaurant all within foot steps, I couldn’t of asked for more. There also is a full spa on site but I will touch on that later! The weather was a little chilly so we skipped the pool, but we did relax in the hot tub while sipping mimosas. Okay well, I dipped my feet in. I forgot to mention I was in Scottsdale a few days prior visiting family and ended up getting severely sun burnt on my front half. Basically, my legs and stomach were fire red and the hot tub wasn’t my best bet unfortunately. Next, I need to talk about the food. REDS Restaurant is connected to the hotel and serves breakfast, lunch and dinner. The inside is very comfortable with a contemporary feel, with plenty of seating and a full bar. The girls and I decided to get a bite to eat before taking a hike and boy, were we pleased. Each ordering something different, we had a variety of foods to share such as, chilaquiles, bagels, eggs and bacon etc. The food was also plated very nicely and made for an eye-appealing spread. Our meals were very good and left us stuffed, just as we had hoped. Our service at REDS was also very pleasing, no complaints there at all. If time permitted, I would have loved to stop in during evening hours for Happy Hour! 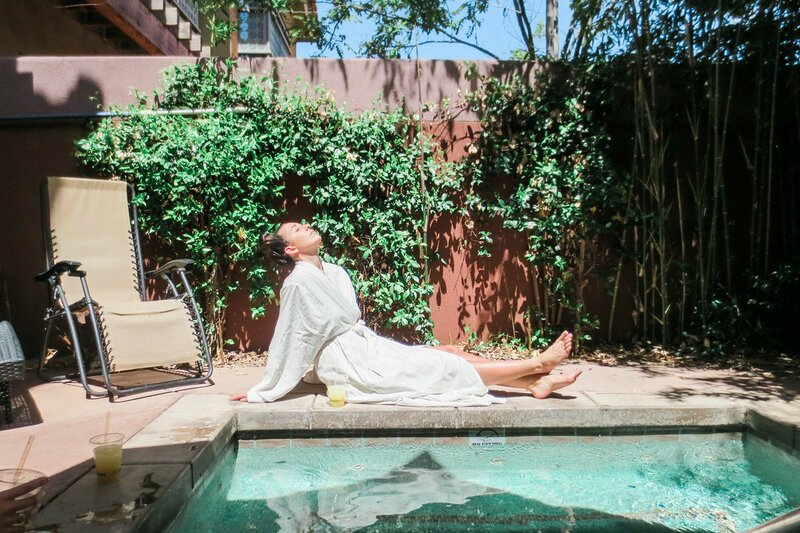 Overall, I was so beyond satisfied with our stay at Sedona Rouge Hotel & Spa. 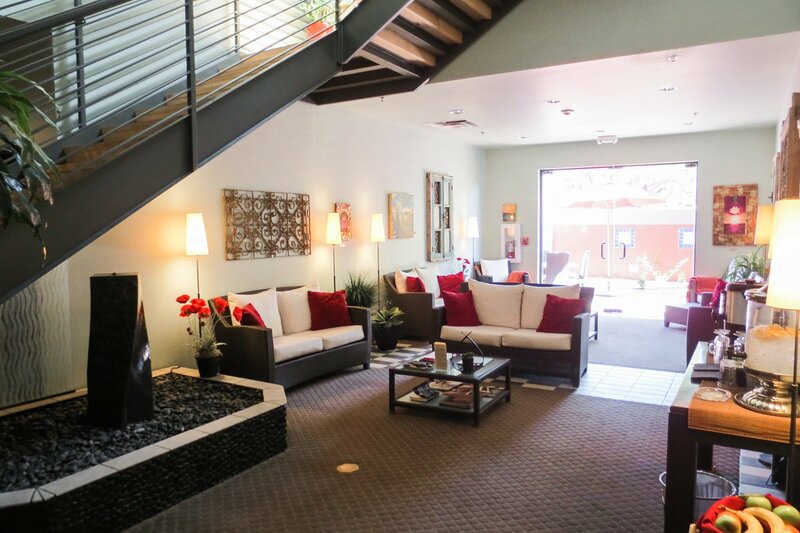 The staff really out did themselves by catering to our every need all while being so friendly and professional. The property is gorgeous (Be sure to get up early enough one morning and make it to the roof-top for the stunning sunrise views, Thank you Brooke for the pictures!) The food is yummy and having a room-service option is pretty important! The location was perfect too. We were in walking distance of a wine bar (YES!) 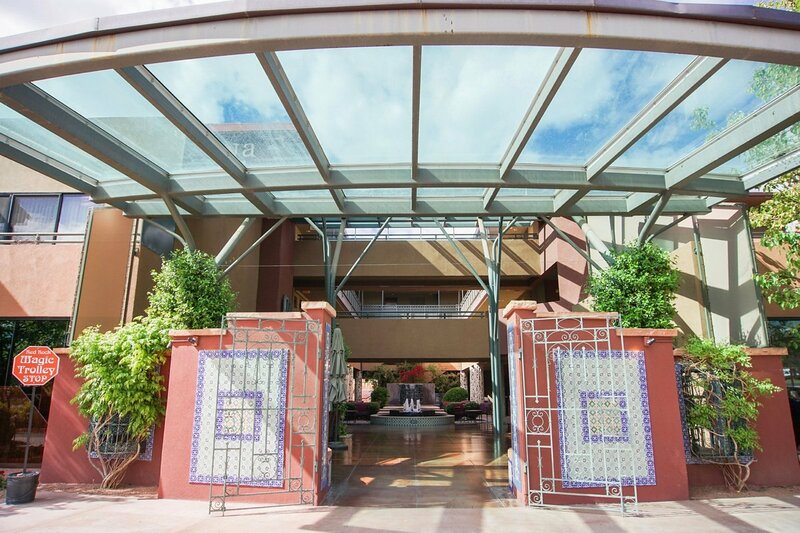 and just short cab distance of attractions, food and shopping. Thank you for having us Sedona Rouge! 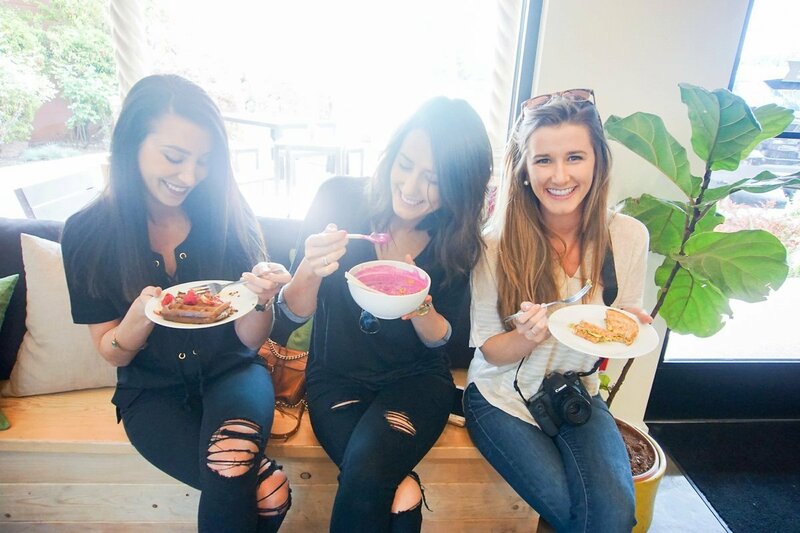 When it came to food, we scoped out all the best local spots prior to arriving as all of us girls love to eat! 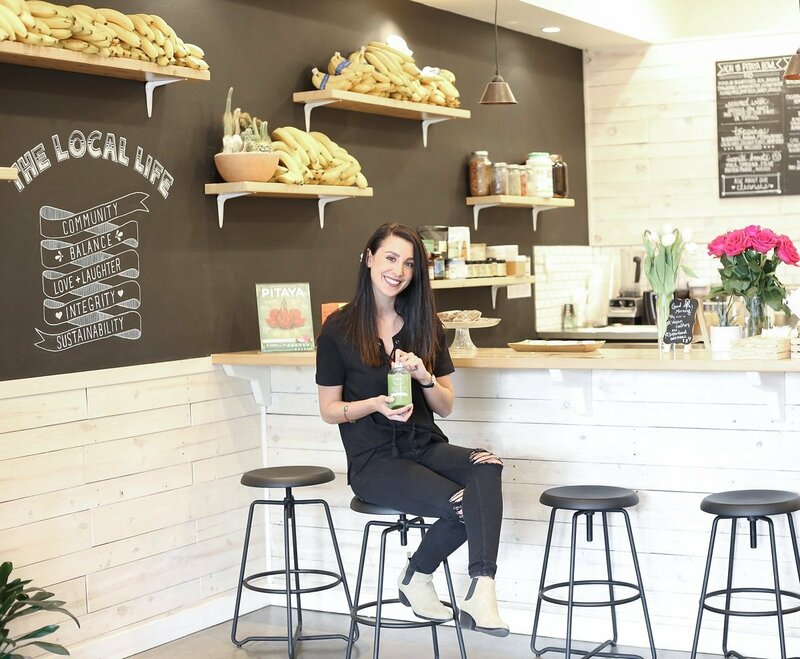 Our first stop was Local Juicery, an organic cold-pressed juice bar and superfood kitchen. We arrived in Sedona pretty late the night before and got up decently early to check this place out. It was SO worth it! 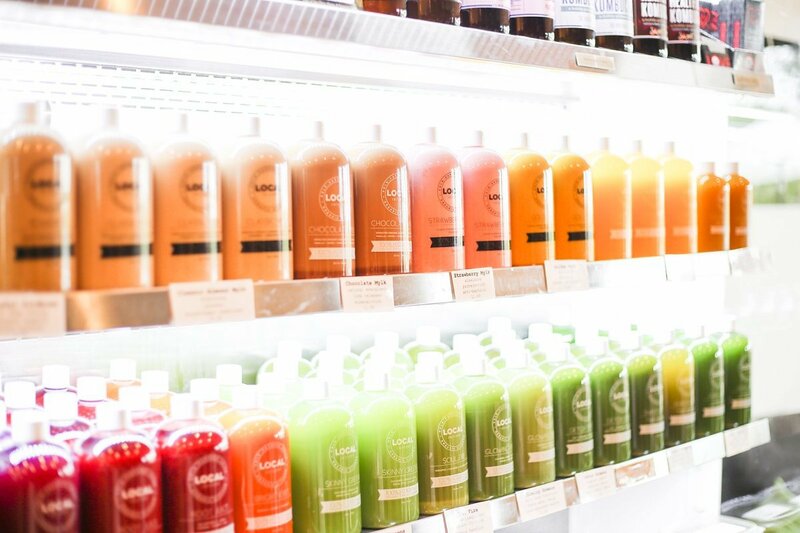 I love to visit different juice bars, because I love smoothies and healthy treats that taste yummy. Summer, the owner, made us feel so welcomed with her warming smile and friendly staff. 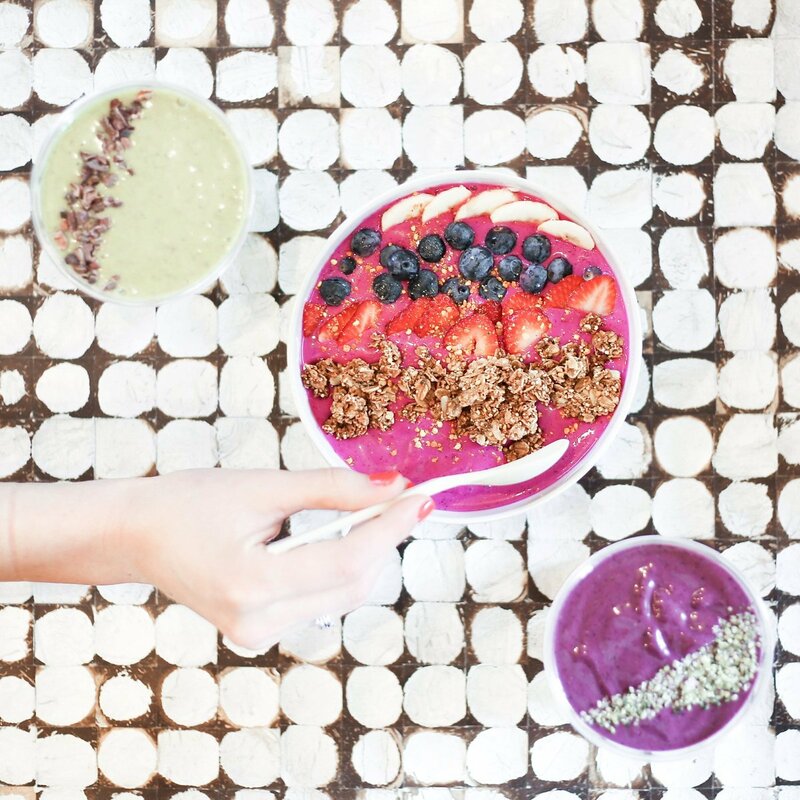 We were able to try multiple items off of the menu including smoothies, an acai bowl, avocado toast and waffles. Each and every dish and drink was DELICIOUS! My personal favorite was the ‘Mint Chip’ Smoothie. When I tell you this smoothie tasted like mint chocolate chip ice cream I am NOT exaggerating. I crave it all the time now, its too good for words. I also was a big fan of the overall aesthetic of the shop. 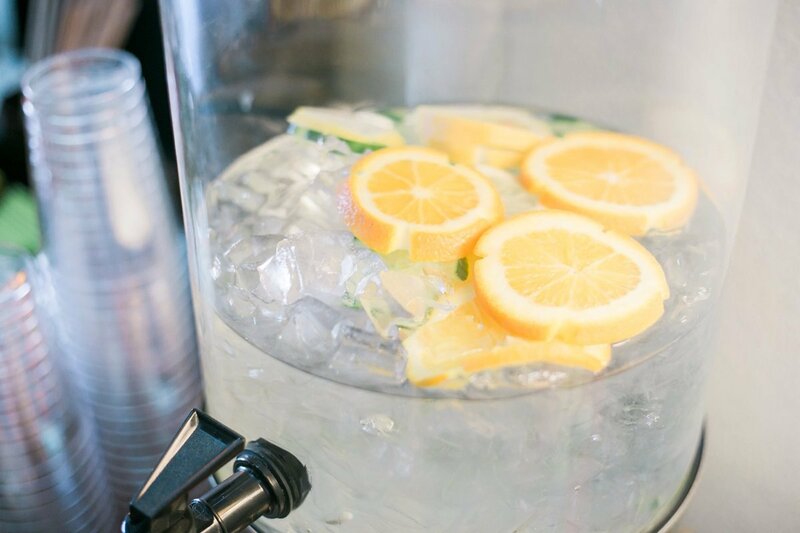 Clean white with pops of color from the beautiful rows of juices and the fresh blooms displayed on the counter. 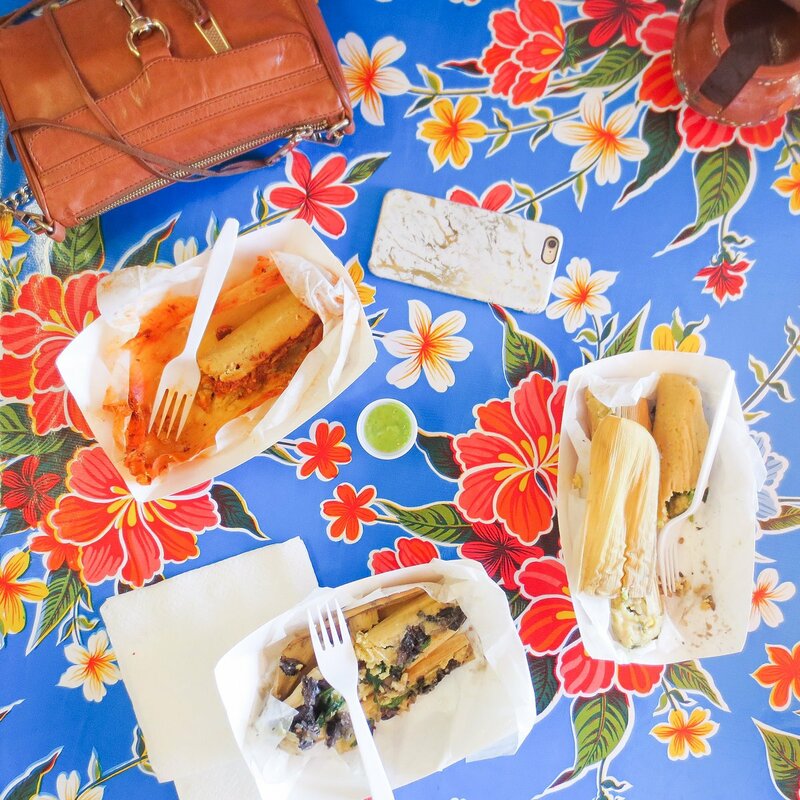 This place is so good that we made a second stop here after our hike to Devils Bridge, we just couldn’t get enough! Fashion: My black top with the tie up front is Who What Wear for Target, I LOVE it! I’m sure you recognize my jeans, they are my favorites. They are from Express and are high-waisted skinnies. My tan booties are from Old Navy and were such a steal for $10 on sale! I just want to make note that I am not going in order when it comes to food. I’m jumping around a bit but I will do my best to make sure you all can follow along (first time travel blogging probz!) 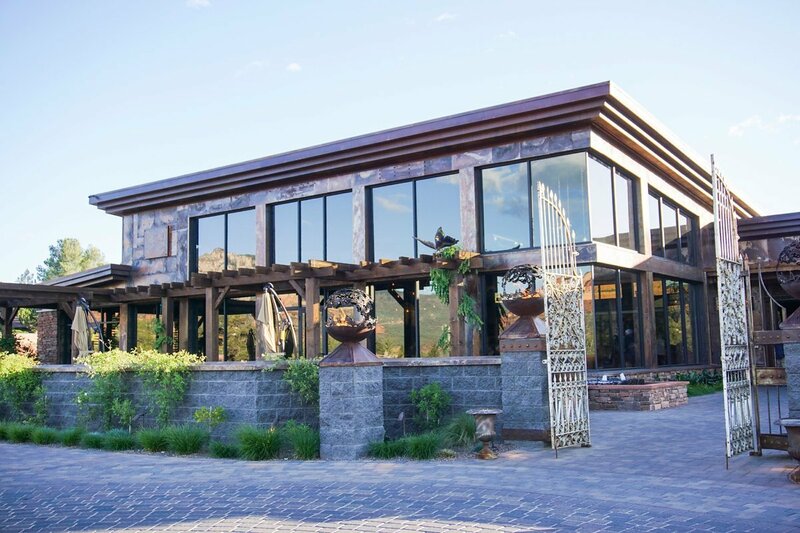 This next restaurant, Chocola Tree, is unlike any place I have ever been! We stopped for lunch on our last day in Sedona before making way to the spa. 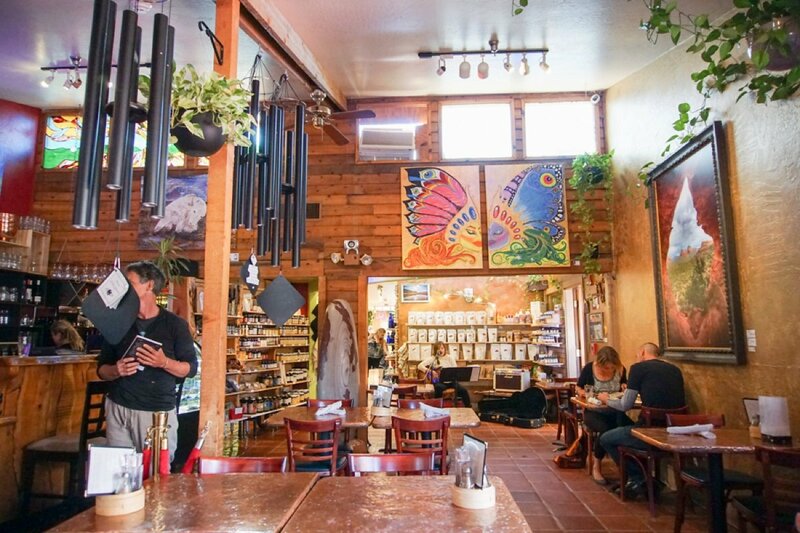 I would describe this place as free spirit, hippy-ish and purely organic. There is such a soothing presence to this spot. The back ‘patio’, if you will, is full of hammocks, dream catchers, cute little tables and nature. We spent a lot of time out there, enjoying the good vibes before stuffing our faces. 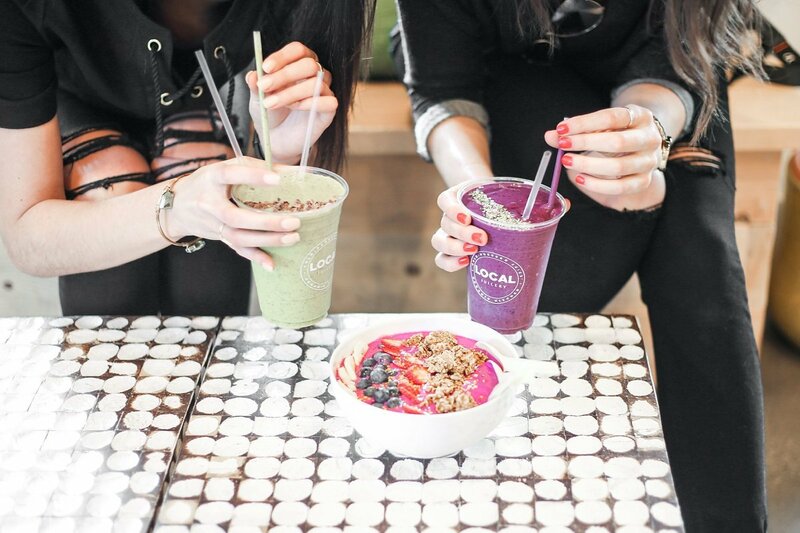 The menu is 100% organic, no grain, no gluten and no GMO. 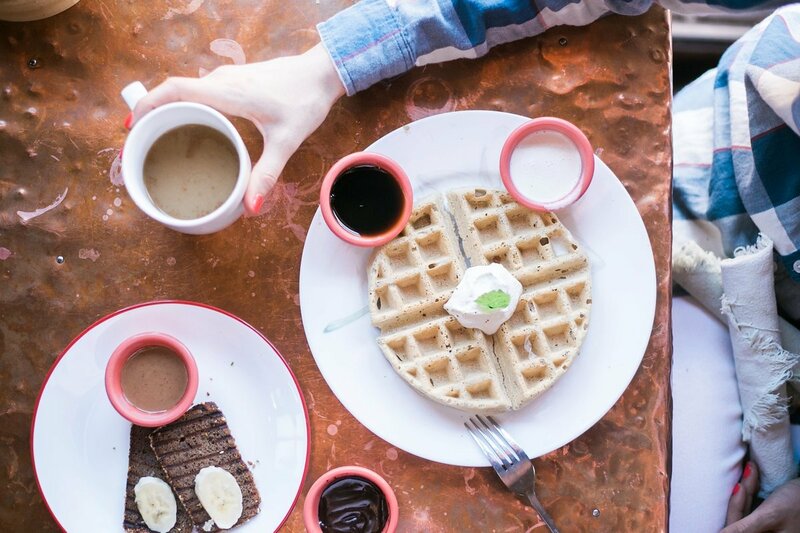 They offer unique drinks and dishes, all very tasteful. Chocola Tree also offers live music, which I adore! Tasty food, awesome atmosphere and great music are all ingredients for perfection. I really enjoyed this spot, it’s the place to eat, relax and just hang out with good company. Fashion: My white jeans are from Buckle and are the brand, “Flying Monkey.” My olive sweater is from Old Navy and my lace up flats are Nine West, found at Nordstrom Rack. I can’t forget my favorite aviators! They are gold rimmed with black frames and are by Tory Burch. Hidden gem, that’s all I have to say. Tamaliza Market was recommended to us by Summer over at Local Juicery, therefore we knew we needed to try this place out! The menu is pretty small, but that’s all It needs to be. Tasha helped me order (thanks girl),as I had never had authentic tamales before this! Inside they offer one or two tables to dine at, in which we enjoyed. The space is so small, giving it such an authentic feel. We were able to ask some questions, being so close to the kitchen area, and learn more about the history. The recipe of the tamales came straight from Mexico and is made up of non-GMO organic corn flour masa, no lard or processed foods. The tamales are made fresh each and every day which was apparent as soon as I took a bite! So yummy and pleasantly filling! 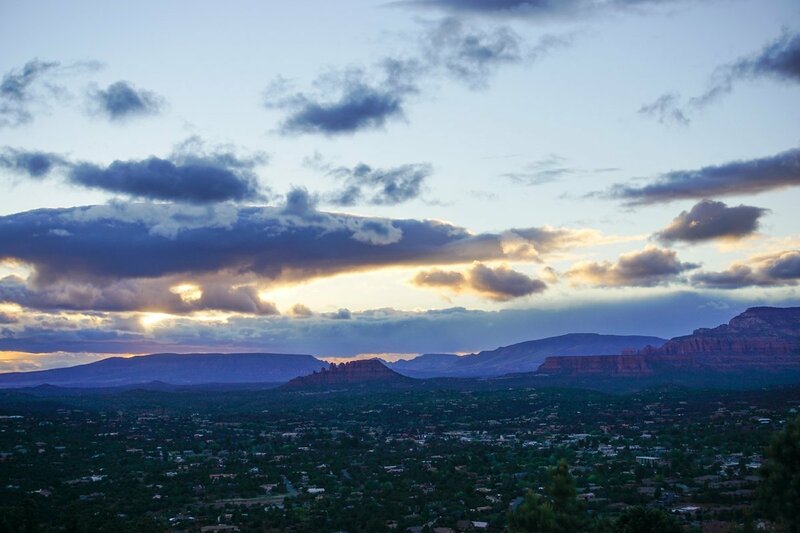 This is a place you NEED to try if you are in Sedona! Seriously drooling already. We were pretty excited to doll ourselves up and try Mariposa, which is just one of four of Lisa Dahl’s restaurants. I can honestly say I was pretty blown away by this place. The view is unbeatable, pictures do not do it justice. 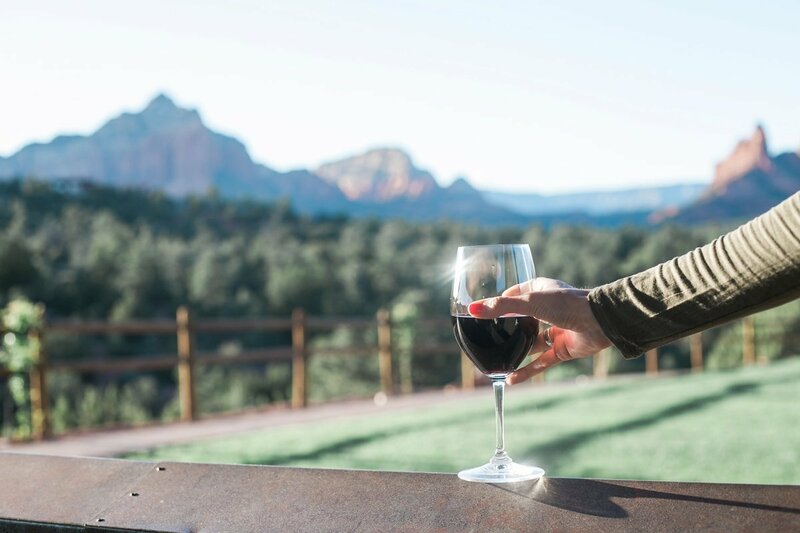 The back patio overlooks the mountains, multiple herb gardens and is a perfect spot to sip wine and enjoy a delicious meal. The food is INCREDIBLE!! We basically tried one of everything, we just had to. A favorite appetizer of mine was the fried avocado bites that come with smoky Pimentón Aioli, YUM! Being a big steak lover, I was so pleased with the filet & lobster, it was cooked to perfection! They also offer a wide wine list, which is pretty great if you ask me. If you are going for dinner, be sure to make a reservation and catch the sunset, you will not be disappointed. Fashion: My top is by Tresics and is actually Tasha’s (Thanks for letting me borrow girl!) My choker is by Honey Rose & K and is a repeat accessory for me. You scream, I scream, we all scream for PIZZA! Yes, I would choose pizza over ice cream any day. 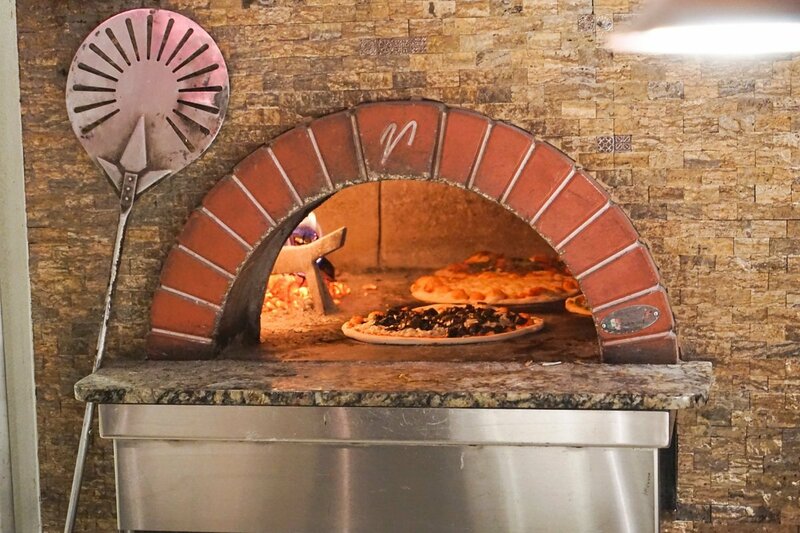 I am pizza FREAK and any chance I get to try a new pizza spot, I take! Pisa Lisa is another one of Lisa Dahl’s restaurants, this women is not only sweet and kind, but such a talented chef and a true inspiration. The girls and I decided that we needed some pizza on that Saturday night and ended up needing to try the salads and tomato bisque soup as well. The salads are fresh and delicious and I can’t even put into words how amazing the soup was. 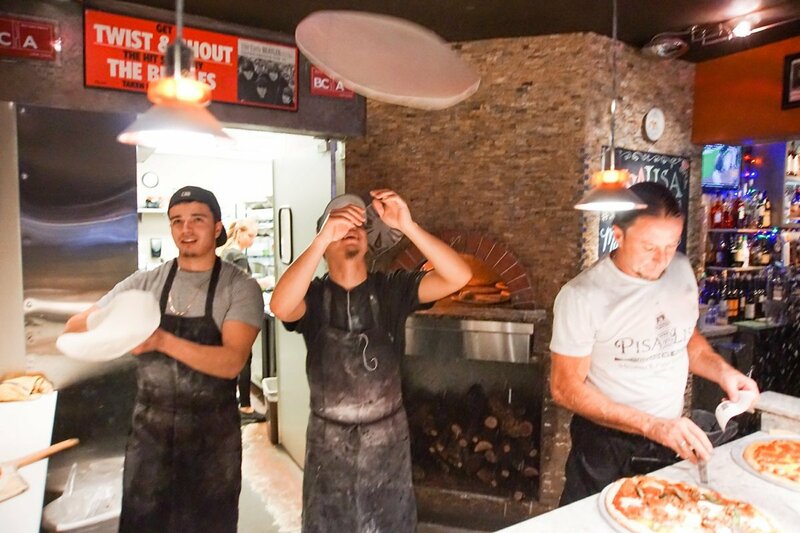 They offer plenty of different types of pizzas from traditional, to white sauce and have that part of the menu split into “Pizza Rosso” and “Pizza Blanco” which makes it easy! Another nice thing about the menu, is the suggested wine pairings. Typically at a pizza spot you wouldn’t come across this type of detail in the menu. If you are in the area, be sure to visit all of Lisa Dahl’s Restaurants, they are all so worth it! You may even run into her, she makes it a priority to stop in at each restaurant each night. Before I briefly talk about this hike, I want to mention that this was my first actual hike on a mountain! I have been on small hikes around waterfalls and what not in Ohio, but nothing comparable to this one in Sedona. I was a little nervous at first, knowing Brooke and Tasha have been on some intense trails but very excited to lose my hiking virginity! The hike was about 2-4 miles depending on where you start with landings and beautiful views along the way. I would say it isn’t too hard of a trail, coming from someone who does not hike. This would be a good place to start, just make sure to take some short breaks along the way! The ending spot is so awesome and worth the line you have to wait in to get a picture. I would recommend squeezing this hike in, early morning or sunset. I enjoyed this particular spot, since I love to shop. This area is full of galleries, shops and restaurants. When we first arrived we stopped into a little spot for a few glasses of wine then made way into the shops. One of the galleries offered mimosas which was a fun little treat as we gazed at all of the beautiful art and jewelry. 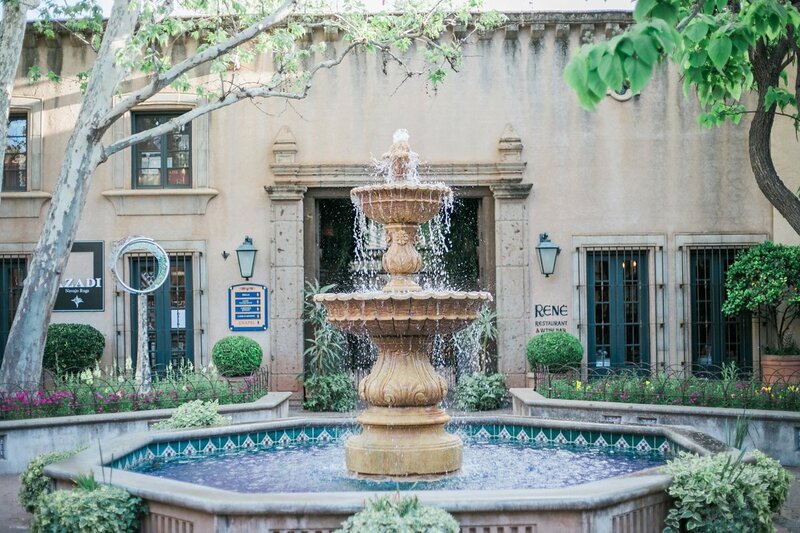 The fountains, arch ways and cobblestone paths make this area so pretty and picture perfect. This is a decent sized shopping area, I would suggest taking a chunk of time out of your day to get the chance to hit every place without having to rush! The girls and I decided to drive around and doing a little sight-seeing, a travel must. We stopped at Chapel of the Holy Cross and I was so glad we did! There is parking up by the church and the church doors are open during the day so that tourist can take a look inside. 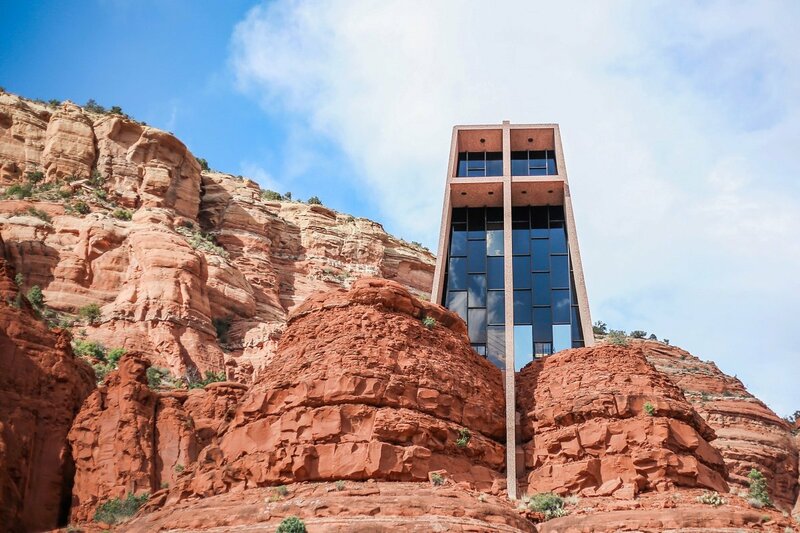 The overall structure of this church is stunning, it sits among the red rocks and is so unique. There are plenty of gorgeous views of the mountains as the church sits at an elevation of 200ft. Be sure to take a peek inside the gift shop located downstairs, there are some great souvenirs! We timed out our visit to Airport Overlook to be right around sunset. The area is crowded, tons of cars coming in and out, luckily there is a pretty big parking lot. The viewing spot is located across the street and as we did, I would suggest visiting around sunset if you can handle the crowd. The sun hitting the mountains makes for some pretty beautiful pictures! PS. It was a little chilly, I wasn’t very prepared but I want you to be! If you plan on standing out at the viewing spot be sure to pack layers. Luckily, Tasha is pretty ballsy and found us the perfect parking spot up front in which we could pop out of the sunroof and snap some pictures once it was too cold. We made massage reservations for our last day, at the Sedona Rouge Spa. I was looking forward to this experience as soon as we booked it! I am not one to schedule regular massages, or take spa days, so this was a treat for me! The staff was super friendly and welcoming, always so important. 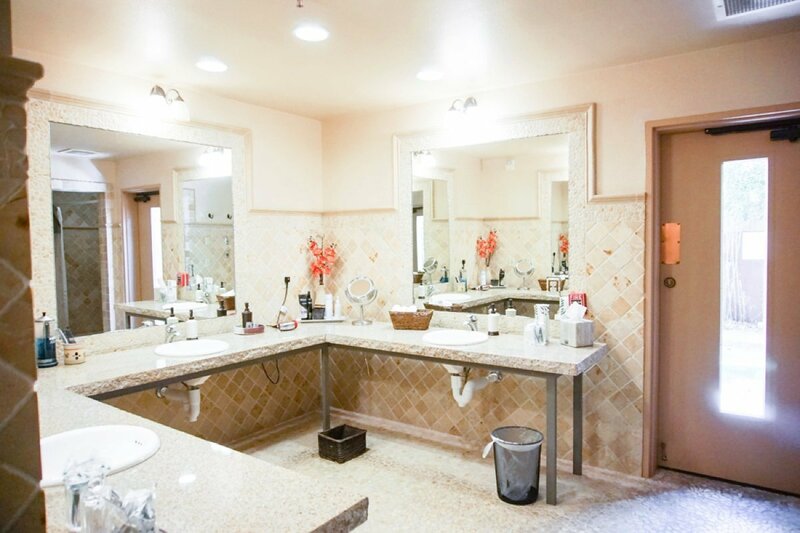 They have a huge ladies locker room area which includes a steam room, sauna, and access to a private Jacuzzi out back. All three of us were very pleased with our masseuse and overall massage experience. We all chose a classic Swedish with hot stones, GREAT choice! Oh, and I can’t forget to mention, we were able to enjoy a bottle of wine that we brought into the spa. I will definitely be booking a massage next time I am in the area! WINE! First of all, I need to thank Tasha for dragging Brooke and I out of the room on Saturday night (OK, for dragging me out of the room!) I was super exhausted and just didn’t feel like there would be any exciting place opened past 9pm in the area. I was wrong. 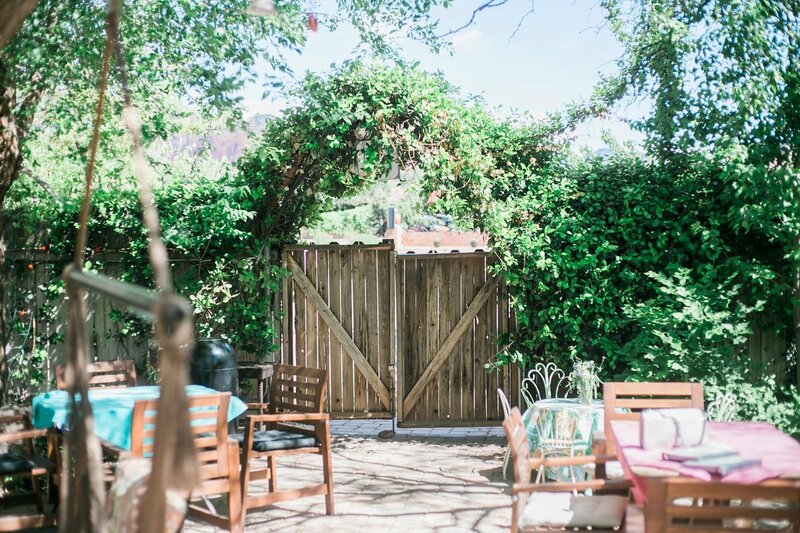 Within walking distance was the most adorable wine bar called Vino Di Sedona. People were outside mingling as we arrived which made me intrigued as to what this place was about. The inside has a wall of wine bottles, in which you can choose to purchase and take home, or purchase and drink on-site. There was live music, a dance floor and locals all around! Everyone was very friendly and seemed to be enjoying themselves. When we first arrived I told myself I would have one glass of wine and just relax..nope. The atmosphere was so fun I definitely had a few glasses and people watched. We were lucky enough to run into JB, who is the maître d’ over at Mariposa. Soon enough our tables were combined and we were chit-chatting away, while snackin’ on an impressive cheese & meat plate that he brought over to our table. Thank you for showing us a good time JB, I hope to see you again on my next trip to Sedona! This blog post is partially sponsored. I was not paid to voice my opinion, all opinions are my own and are REAL. Collaborations were discussed and agreed upon before arrival. Our trip was thoroughly researched and a list of places we wanted to stay at, eat at and shop at was formulated prior to the trip. 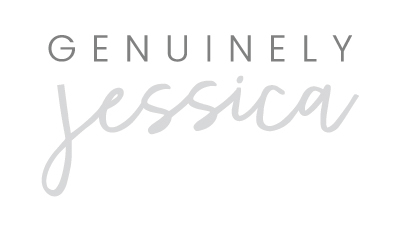 Our collaborations are as followed- Sedona Rouge & Spa, Mariposa, Pisa Lisa, Chocola Tree and The Local Juicery. I have to give props and thanks to Tasha and Brooke for working so hard and pitching to the places listed above and communicating with them to get together an agreement. You girls ROCK! I am so blessed to have friends like you!